It is interesting to see a book, which was first published in 1990, being republished seventeen years later, making it the fifth reprint. 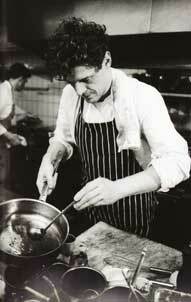 That alone must say something about the lasting qualities of the book and its author, Marco Pierre White. 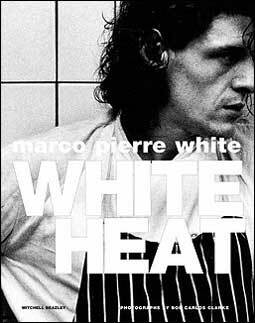 If you have read the autobiography you will have come across a lot of what is in the introduction to this book but its not to be missed because this was Marco Pierre White then and the autobiography is written with hindsight. The black and white mood photography by Bob Carlos Clarke is still as stunning now as when first published and the Marco Pierre White quotes are a delight to read. The food photography looks a bit dated seventeen years on but still shows the dishes well. "Nine out of ten English chefs have their names on their chests. Who do they think they are? They're dreamers. They're jokes. Just ask yourself how many chefs in this country have Michelin stars and how many have their names on their jackets. We all wear blue aprons in my kitchen because we're all commis. We're all still learning." The main body of the book is made up of recipes from Harveys. What did I miss all those years ago? Just reading them makes your mouth water . . . Ravioli of Lobster with a Beurre Soy Sauce, Tagliatelle of Oyster with Caviar, Tranche of Calves' Liver with a Sauce of Lime! The list is endless and there are some wonderful dessert recipes too like Hot Mango Tart and Marco Pierre White's take on rum baba, Savarin of Raspberries. You will also find two of the dishes that have become very well known recently following the latest Hell's Kitchen - Braised Pig's Trotter 'Pierre Koffmann' and Lemon Tart. Whilst none of these recipes are for the complete beginner they are not so daunting that most enthusiastic home cooks cannot do them. Certainly fare to impress your friends and guests with should you cook them for a small dinner party . . . but do practice them first. Hidden away at the back of the book are some priceless gems such as stock recipes, ones which you can prepare at home, basic pasta . . . those things that really bring a dish together or form the basis of the dish. Seventeen years on this book remains as fresh as the day it was first published and comes highly recommended both for its insight and for its cooking.